The present Choir was formed in January 1947 and so we are currently (2017) celebrating our 70th Anniversary Year. Records show that a choir existed intermittently from 1913 – and we have a 1919 Minute Book to prove it! However, we choose to date the ‘modern choir’ from its almost unbroken run of 70 years from 1947. Remarkably, the Choir has had only three Musical Directors during this period. The founding Musical Director was Sydney Bowden who served until 1982 taking the choir through 37 years of song. The continuing strength, existence and enthusiasm of the choir today rest on the foundation laid by Sydney Bowden. His accompanist for almost all of this period was Betty Gluyas, who was succeeded by Caroline Mollard in 1981. Sydney and Betty are shown in the earliest photograph of our choir taken in 1949. 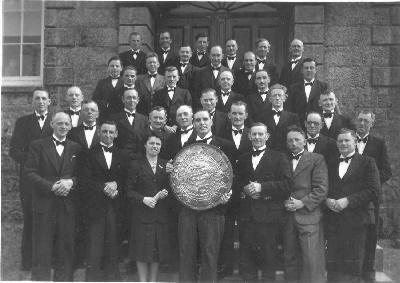 Sydney is holding the County Shield awarded to the Cornwall County Champions. Music Festivals played an important part in the choir’s early years. As an indication – during its first 60 years (to 2007), the choir participated in 58 festivals, winning 23 of them and coming second or third in 18 of them. David Eastburn took over as Musical Director in 1982 and built up the membership to 47. Elaine Tangye became accompanist at that time. 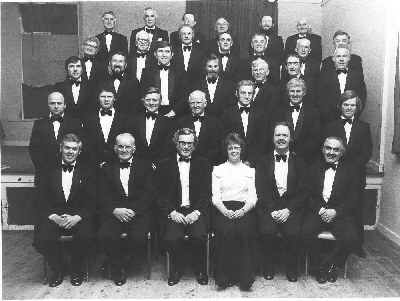 The second photograph (left) shows the choir in 1984 with David Eastburn in command. 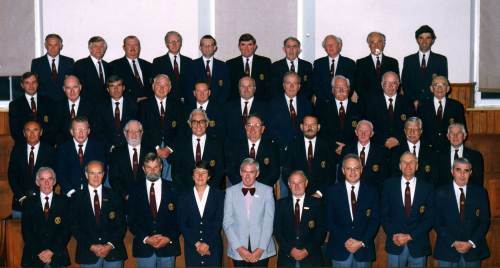 The picture also shows our third and present MD, Ken Downing (front row, left). He joined the choir in 1964, aged 14, as a top tenor and has sung in each section of the choir. He also served as General Secretary from 1976 to 1994. He became MD in 1986. Kathryn Baldry took over as accompanist in 1985; she was succeeded by Colin Anthony. Kathryn became our accompanist once again in 2004. Long service seems to be a feature of this choir! Joint events with other choirs have been increasingly important in recent decades. 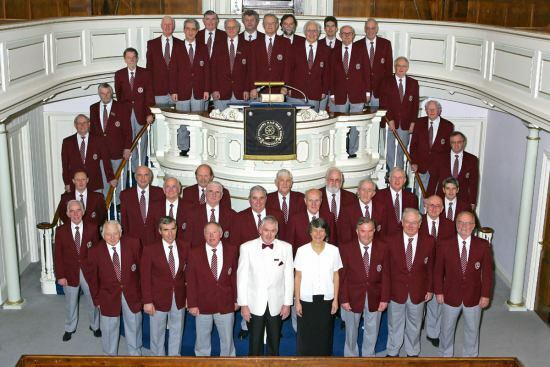 The choir became a founder member of the of the Cornish Federation of Male Voice Choirs. It has participated in the five massed choir concerts at the Royal Albert Hall in London between 1983 and 2013. 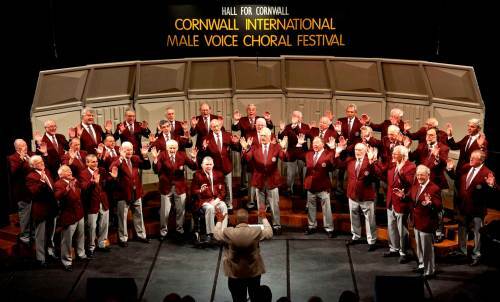 Another major series of events Is the Cornwall International Male Choral Festival, founded in 2003 by our (now) Choir President, Dr. Roy Wales. There have been 8 festivals between 2003 and 2017. We are proud to have participated in every one of these 5-day events held across the County. They are truly international events and we have learned a lot from our participation. Here is an excerpt from The Stithians Times describing our involvement in 2015. "To give it its full title – the (Seventh) Cornwall International Male Choral Festival – in round figures: 70 choirs, 60 events 50 locations. This has been our main focus for the last few months. Our choir has participated in several ways in all seven of these festivals since 2003. The Festival (29th April – 4th May) was based in Truro as usual, involving major Gala Concerts there but also Regional Gala concerts in major towns from Bude to St. Just and daytime events at many locations. Our main event this year was hosting a Regional Gala Concert at Helston Methodist Church on Sunday 3rd May. Before then, some of us attended symposia, workshops and masterclasses at Newquay. These events provide valuable opportunities to learn something of the latest thinking about voice production, concert programming, presentation (smile! ), conducting techniques and so forth. Workshops for us singers may sound like trying to teach old dogs to learn new tricks – but it can be really useful to be forced out of our comfort zones sometimes. Later, some choir members worked at the Cathedral as stewards at the Opening Gala Concert – and were able to enjoy the performances as well. 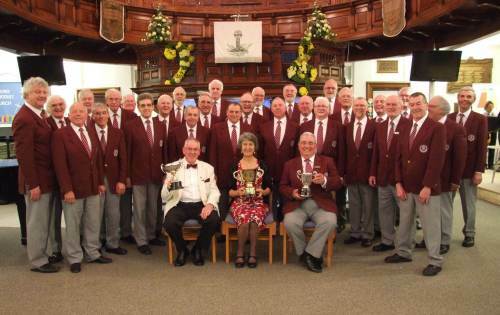 We were joined in Helston for a Regional Gala Concert by the Sons of Lafayette (Georgia, USA), Westerton Male Choir (Glasgow) and Snowdown Colliery Choir (Kent) for a very successful concert compèred by John Brock. Judging by the applause, the capacity audience enjoyed our choices and the contrasting styles. We were delighted that Dr. Roy Wales, our choir President (and founder of the Festival in 2003) was able to join us from his home in Sussex. The video shows us performing in this lovely and well-appointed venue. We topped off the concert by taking our guests to the Helston Football Club for pasties, saffron cake, beverages and a bit of a sing-along." Closer to home – we were invited in 1983 to perform 2 or 3 times a year at Falmouth’s Princess Pavilion Monday night concerts. Here in 2017 (after 34 years) we are still doing it! Appearances on TV have extended our range of experience. BBCTV’s Children in Need, two appearances on Songs of Praise and ITV’s How the West was Made (Cornwall, not Dodge City!). Many 2-3 day tours visiting other Choirs have been enjoyable experiences. These are too many to detail here: three trips to 10-choir concerts at the Fairfield Halls (Croydon), Ely Cathedral, several trips to South Wales, East Anglia, Kent, Surrey, Sussex, Lancashire, Staffordshire, Huntingdon and Malta. Most of these tours generate return visits by the hosting choirs. Participation in the 11th Malta International Choir Festival was one of many highlights. We gained third place in this competition and we were also fortunate to be asked to sing in St. John's Co-Cathedral in Valetta. We were also very pleased that we could handle a very difficult test piece - sung in Latin - unaccompanied. Another way of reaching our public is of course via recordings. Our history covers vinyl, cassette tapes, CDs and now Youtube and Facebook. We have not yet reached the sophistication of digital downloads (for money) – but doubtless this will come. Our CD collection (solely our choir) numbers six. 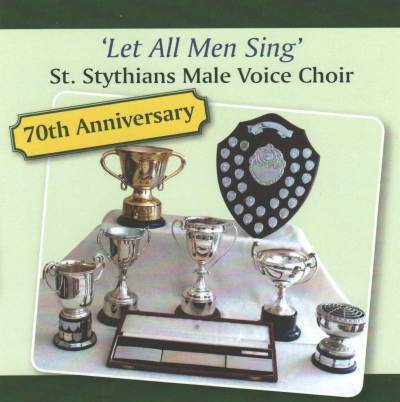 Our most recent recording, Let All Men Sing, celebrating our 70th Anniversary, is shown above. Recordings made with other choirs at festivals and major events number around 25. 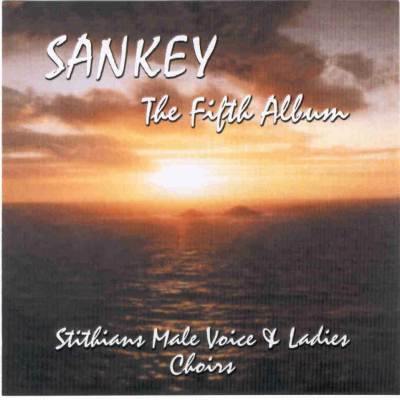 A remarkable set of recordings of Sankey hymns was made with Stithians Ladies Choir between 1973 and 1992: Sing with Sankey up to Sankey – the Fifth Album. Together they form a collection of 73 hymns – possibly one of the best collections in the world. We regard these recordings as ‘remarkable’ because long after our regular recordings have reached their ‘sell by’ date, the Sankeys are still selling (i.e. in 2017) in UK, USA, South Africa, Tasmania, mainland Australia, Canada and elsewhere. We are not going to win any Golden Discs – but having more copies printed (now digitally re-mastered) has been a regular event for years. Concerts form the ‘bread and butter’ of the choir’s activities of course. Around about 20 a year would be usual. Twenty-five if one counts Christmas. So a choir member who has done 10 years service will have performed in 250 concerts. It feels like we have sung in more Cornish Methodist Churches and Village Halls than we have hot dinners! Speaking of Choir Members, we recently compiled a ‘Roll Call’ of Singers, Accompanists and MDs since 1947. It totalled 230. This brief history started with Festivals. To finish – Festival Competitions require a lot of practice and preparation and a degree of panic - but much satisfaction. We have suffered occasional public humiliation, plenty of disappointments but some memorable successes. A bit like Life itself. Four of the trophies shown on the cover of our 2017 CD above were won in one evening at the County Music Festival, Truro 2016. Include the friendship – and it’s been a pretty good 70 years.